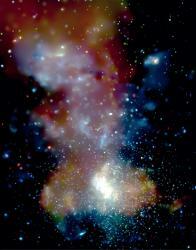 Milky Way Centre - Universe Galaxies And Stars Section. Centre of the Milky Way. Image credit: Chandra. You're looking at the heart of your own Galaxy with X-ray specs. This photograph was captured by NASA's Chandra X-Ray observatory, and shows the three massive star clusters that surround the supermassive black hole at the centre of the Milky Way. These star clusters have so many large, bright stars that the whole area blazes in the X-ray spectrum. This photo shows 1 million seconds of accumulated observing time by Chandra of these mysterious region of our galaxy. The new X-ray image shows three massive star clusters, the Arches (upper center), Quintuplet (upper right), and the GC star cluster (bottom center), which is near the enormous black hole known as Sagittarius A*. The massive stars in these clusters can themselves be very bright, point-like X-ray sources, when winds blowing off their surfaces collide with winds from an orbiting companion star. The stars in these clusters also release vast amounts of energy when they reach the ends of their lives and explode as supernovas, which, in turn, heat the material between the stars. The stars near the Galactic Center also can emit X-rays as stellar corpses - either in the form of neutron stars or black holes in binary systems - and are also seen as point-like sources in the Chandra image.